Did you jet off to an exotic location outside of the EU this summer? Whilst you were there did you try a funky temporary black henna tattoo to complement your golden glow? It may surprise you but these fun, intricate designs can lead to problems which can seriously affect your hair and scalp. If you did have a black henna tattoo, then it’s very important you let your hairdresser know before your next colour services appointment, even if it has faded. Why? Because black henna tattoos can cause you to develop serious allergic reactions to hair colourants – even if you dye your hair often. Natural henna orange-red in colour. 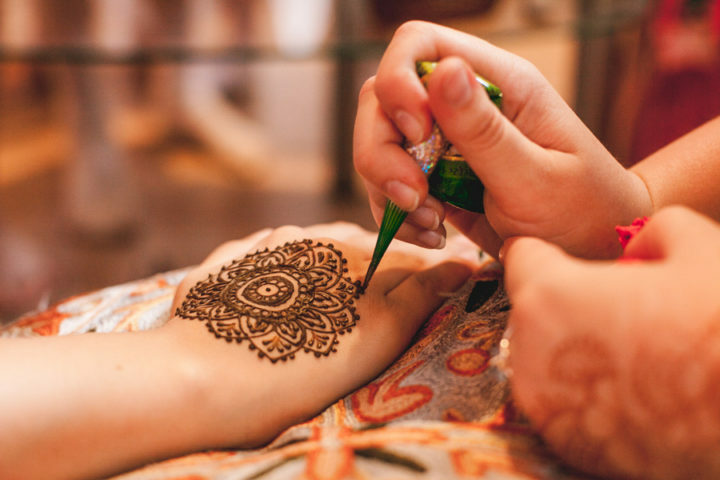 The henna paste is applied to the skin in the pattern of your choice, and slowly leaves behind a stain as the paste dries. This stain pattern can last 2-4 weeks then gradually fades and disappears. However, some tattoo artists offer the much darker ‘black henna’. Unfortunately ‘black henna’ actually isn’t proper henna. These black temporary tattoos can cause painful damage to your skin and may result in the development of sudden new allergies to hair dyes. Why is black henna harmful? The black henna temporary tattoos may contain a substance called PPD (paraphenylenediamine) to create the dark colour. This use of PPD in tattoos (and at such high concentrations) is illegal in the EU and can be very harmful if applied directly to your skin. For this reason the British Skin Foundation does not encourage black henna tattoos. What is PPD and what can it do? Black henna is not, and never was, intended for use as tattoo dye. PPD is used safely and legally as an ingredient in hair colourants but, when applied directly to the skin in a temporary tattoo, it can leave you with a painful allergic reaction and a swollen red ‘burn’. It doesn’t stop there. Even if you didn’t suffer from a bad reaction to the black henna tattoo it can still sensitise your skin to PPD making it more likely you’ll react to PPD elsewhere in future. This is why you need to tell your hairdresser. Hair dye themselves are regulated under the stringent EU cosmetic safety regulation and are perfectly safe to use. If you have had a black henna tattoo on holiday this summer, don’t panic. Just let your Pure Hair stylist know and we’ll carry out a free skin patch test 48 hours before your next colour services appointment for your wellbeing and reassurance.